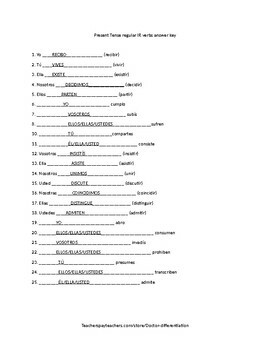 25 question test for Spanish 1 or 2 for Present Tense Regular IR verbs. This is a great way to see if Spanish 1 students can identify the correct pronoun and the correct tense. 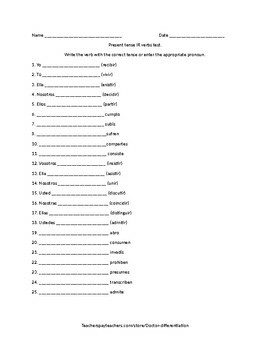 For Spanish 2 students, this is a great test to see what they remember from Spanish 2 or from a review at the beginning of the year. Just print page 1, pass it out, and use page 2 to grade!